The one knitted object in my Sonderknitting Mathematical Knitting Gallery which I haven’t explained is the Coded Affirmations Scarf. I knitted the scarf with a small ball of leftover yarn before I knitted Alyssa’s Coded Blessing Blanket, but after it had occurred to me that you could use mathematical bases to make coded messages, as in this Base Six Code Coloring Sheet. 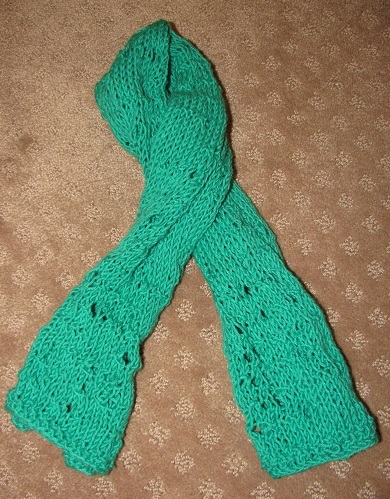 With knitting, instead of colors, you use a different two-stitch stitch pattern for the code. Anyway, the idea wasn’t to be able to decipher it. The idea was that I would know what the scarf said. And the effect is just a seemingly random lacy pattern. But the idea — to knit meaning into a scarf with a coded message — was a complete success. And I still say you could do this with colors on the edge of a picture or anywhere else you want a secret meaning hidden in a pretty pattern. Simon & Schuster Books for Young Readers, 2015. 48 pages. This is another of Patricia Polacco’s tear-jerker touching true stories. This one’s about war, so it’s more for school-age kids, even though it is a richly illustrated picture book. 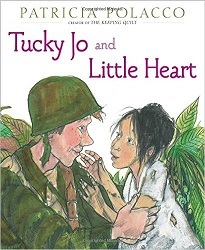 When stationed in the jungle, “Kentucky Jo” meets a little village girl, who tells him about a plant to put on his bug bites. He gets to know the girl, brings her food and toys, and eventually his troop adopts the whole village – until they have to be evacuated. Well, the tearjerker part brings us to the present – when that little girl again shows up in Tucky Jo’s life when he’s an old man needing medical care. It’s good Patricia Polacco tells us this is a true story, or we wouldn’t believe things had turned out so beautifully! Although this is a story of war, and we do hear that Little Heart’s mother was killed by soldiers and her father and brother taken away, the author doesn’t dwell on gory details. Instead, she focuses on the heartwarming part of this little girl and her village in the jungle, providing a bright spot in the middle of war. And in its lovely way, the book shows the lasting impact of love and good deeds. Orbit Books, 2014. 356 pages. 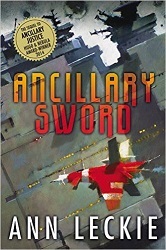 Ancillary Sword is the sequel to the astonishing Ancillary Justice. Breq, the former AI controlling a ship and multiple ancillaries, now in one isolated body, is now the captain of a ship, Mercy of Kalr, and holds a rank of Fleet Captain. Because Breq still has implants to connect her consciousness with her original ship, she can instantly receive information from Mercy of Kalr, though not as effectively as when she had more bodies. In this volume, the events in Ancillary Justice have touched off a possible civil war between different bodies of the Lord of the Radchaai (more fun with consciousness and perception). Breq has gone to a distant planetary system, hoping to help the sister of a former captain she loved who was killed around the time Breq’s ship was destroyed. The gates ships use to travel between planetary systems are down, so Breq is seemingly isolated once she arrives. But a military ship, Sword of Atagaris, accosts them as soon as they enter the system. Something strange is going on. Breq goes onto the space station and sets up quarters where she is not welcome. There are political undercurrents to navigate and plots and counterplots. This book was always interesting and absorbing, but the plot path wasn’t as clear to me throughout as I would have liked. The conflicts Breq faces are mostly local, and it’s not entirely clear how it fits in with the civil war she may have touched off. I have a strong feeling I will like this second book better after I’ve read the third book (and this is the advantage to reading a trilogy after it’s already complete), which I’m going to do as soon as possible. Then I think I’ll understand better how it all fits together. The author still pulls off showing her readers how it would feel to see the world through multiple perspectives all at once. And how it would feel to look at the world without seeing gender. As a side note, there’s an interesting scene when they come to the planet and there’s a Genetalia Festival going on and garlands of brightly colored penises on the wall. Breq is told, “The Athoeki weren’t very civilized…. They mostly aren’t even now. They make a division between people with penises and people without.” Imagine that. Again there are mysteries for Breq to solve and motivations to uncover. And we get to enjoy world-building done by a genius. I’m very curious what’s going to happen next. I’ve made a Normal Distribution Coloring Sheet and posted it in my Mathematical Knitting Gallery, Sonderknitting. I thought it would be fun to talk more about it and show some examples. The reason it’s in my Mathematical Knitting Gallery is that the idea began with knitting. 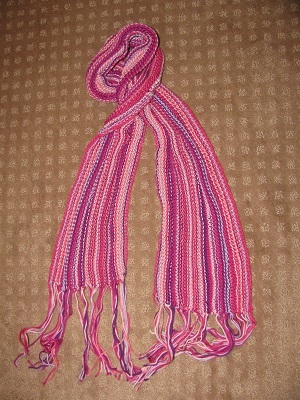 First, it was my Probability Scarf. I read this idea somewhere. Just choose six colors that look good together. 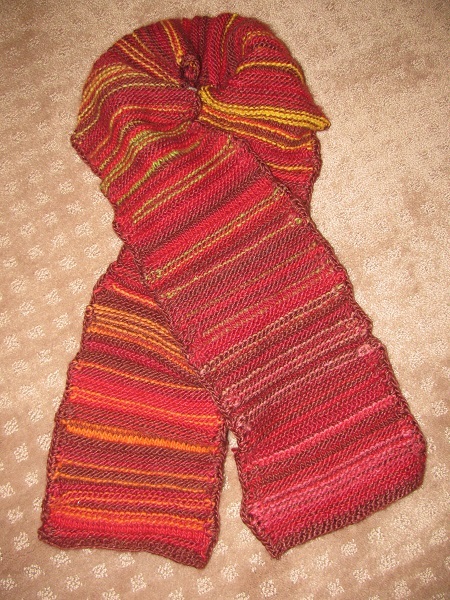 Knit the scarf lengthwise. Assign the numbers 1 through 6 to the six colors. For each row, roll a die to decide which color to use on that row. Flip a coin to decide whether to knit or purl. But in this scarf, all the colors are equally likely. This is called a uniform distribution. What if the colors were chosen from a normal distribution, a bell-shaped curve? That’s what I did with Jade’s Outliers Scarf, using bright colors for the outliers, plainer colors for the middle of the curve. But then I thought it would be fun — and much, much quicker — to do this with colored pencils or crayons. So I made a coloring sheet that is just a grid. But the instructions explain how to use random numbers chosen from a normal distribution to color the sections in the grid. Since a lot of characteristics in people or in nature have a normal distribution, this gives a good feel for how people vary. It also explains why the outliers might feel like oddballs. And why one outlier might have a hard time finding another like themselves. But don’t change, outliers! You are what makes life beautiful! I’m still going to try some other color schemes. I’m thinking it might be time to buy some colored pencils with more shades. But meanwhile, it occurred to me that I could get more shades if I used computer coloring. My grid is a table in Microsoft Word. And you have the option of coloring each cell, specifying a number between 0 and 255 for the red, green, and blue elements in RGB mode. So I went back to random.org and generated numbers from a normal distribution with 128 (right in the middle) as the mean and 42 as the standard deviation. So the only way the numbers would go past 0 or 255 would be more than 3 standard deviations out from the mean. (With 990 numbers generated, only one did.) I’m thinking about doing it again using a standard deviation of 64, in which case there would be more variation, and you’d have more using 0 or 255. It was interesting to do. The majority turned out to be grayish. You’d get the brightest squares when one element was very different from the other two. It took a long time — I’m sure it would be fairly simple to create a program that would generate one of these charts, so maybe I’ll do that sometime in the future. I’m also thinking about doing the same thing but using the HSL color model available in Word. HSL stands for Hue, Saturation, and Lightness — but it also uses numbers 0 to 255 for each one. Meanwhile, I feel like my intuitive grasp of the normal distribution has grown. But mostly, I think these are pretty. The Experiment, New York, 2015. 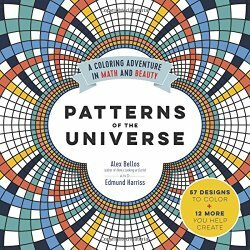 I was going to wait until I’d colored more patterns to review this book, but now I’ve decided that having read all the text, I can tell about how fascinating it is. 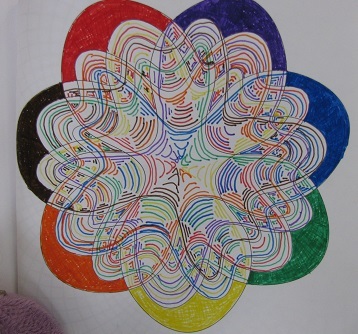 The idea is wonderful: Mathematical patterns to color! There are 57 designs to simply color, and then my favorites are 12 more designs that you help create. Some of the designs are based on Voronoi diagrams, transformations, fractals, tilings, knots, polyhedra, Fibonacci numbers, and, yes, prime numbers. The one pattern I have already finished coloring is the Sevenn — a Venn diagram of seven sets. 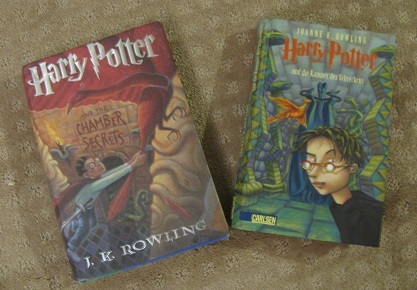 And coloring it made me glad I have another book from which I can make copies and try it again. 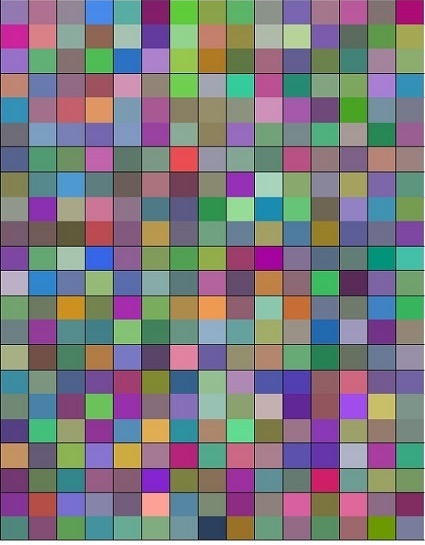 This is where they have more patterns involving prime numbers and randomness, as well as cellular automata, Latin squares, and space-filling curves. The digits from 0 to 9 represent the directions in the key at right. Choose a color for each of them. Starting at the dot, draw a short line (about half an inch) for each of the digits in pi (given above) in the direction of that digit. So, start with the 3 color in the 3 direction, then continue from that point with a new line in the 1 direction in the 1 color, and so on. When I looked at this section, it occurred to me that my mathematical knitting projects are an example of mathematical coloring — with yarn! They did have a way of coloring prime numbers. 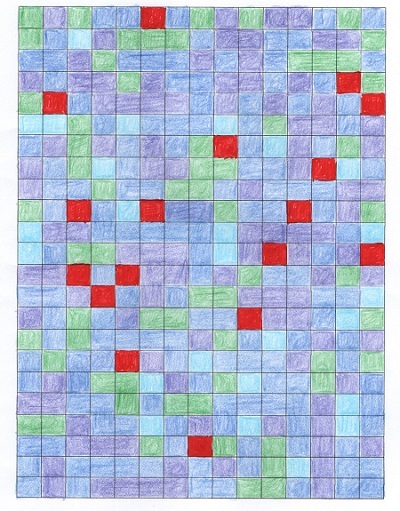 Personally, I think my own way is more interesting, assigning primes a color and then coloring each multiple according to its prime factorization, whether in a grid as in my original sweater or the prime factorization blankets, or in a line in the prime factorization scarf or the prime factorization cardigan. However, the cool thing is there are quite a lot of new ideas that could be translated to knitting — and this book got my brain spinning in new ways. It also made me realize that I could make my own coloring sheets. My knitting is coloring with yarn, and why not make these patterns available for people to try with their own colors? This book was the nudge that got me to pull out the diagrams and post them on my Sonderknitting page. I’m not an artist, so they are simply made with tables, but I think the prime factorization chart is especially helpful for learning about primes. And the prime factorization charts in other bases are helpful for understanding other bases. The Pascal’s Triangle charts show you pretty patterns from Pascal’s Triangle, and the normal distribution chart gives you a gut-level feeling for the normal distribution that’s different from what you think when you see a bell-shaped curve. I’m looking forward to what new ideas will spark as I color the rest of the patterns in this book! And I’m also looking forward to seeing how pretty these patterns will turn out and what new insights I’ll get. It’s a win all the way around. Source: This review is based on my own copy. Thomas Dunne Books (St. Martin’s Griffin), New York, 2015. 276 pages. When I saw author Ann Jacobus at the YALSA Symposium, I knew I’d met her at a small conference, where she’d been an organizer. I assumed it was one of the many KidLitCons I’ve been to, but when I had her sign her book and mentioned KidLitCon, she said No. As soon as I turned away, I remembered, and went right back to her table. I should have known – when, after all, the reason I decided to get a copy of the book was that the Eiffel Tower is on the cover and it’s set in Paris – I met Ann Jacobus at an SCBWI (Society of Children’s Book Writers and Illustrators) conference in Paris almost exactly ten years before I saw her in Portland, and she was indeed one of the organizers. Now, I’m not the best reader for a dark book – I don’t tend to enjoy them. This book is dark, and it took me awhile to get it read because of that. But the book is well-written, and the concept is intriguing. Summer is in Paris staying with her Mom, trying to repeat and finish her senior year of high school, because she keeps getting kicked out of schools in America. She has to finish high school and graduate from college before she turns twenty-two in order to inherit her grandfather’s wealth. There’s a lot of pressure on her, and Summer doesn’t like it. She thinks a lot about death. She researches burial customs of different cultures on the internet. Her father died years ago. Summer carries his flask with her, filled with vodka to help her get through. Summer would like to have a romance in Paris, and she meets two people who might fulfill that desire. One is a student at her school, Moony (Munir), who walks with a limp because of a bad car accident when he was younger. Moony is uncommonly kind – and he doesn’t deserve to have Summer’s mess in his life. Kurt is a handsome man Summer meets at a Paris metro station, just after a woman throws herself onto the tracks in front of a train. Kurt keeps showing up. He seems to know Summer’s thoughts. There’s a smell of decay about him. I said this book is dark. That darkness, in Summer’s life, is personified in Kurt. Yes, there are some paranormal elements going on. They are done with excellent touches, making me want to reread it now I know all that’s going on – but I don’t want to give it away for other readers. Let’s just say that we watch more and more things in Summer’s life fall apart. The novel doesn’t end badly, though – and that’s because of Moony. And Ann Jacobus shows us Moony’s character, persistence, and kindness in a way that we believe the ending. But Moony isn’t perfect. We also see hints that he’s not helping Summer because he doesn’t know anything about despair or problems. And that works into the ending as well. There’s more I’d like to say, but it gives too much away. (Feel free to talk about the ending in the comments if you’ve read the book!) 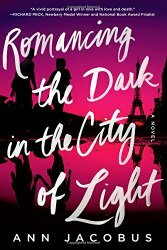 This is a well-written book about a suicidal teen, set in Paris. (The title is perfect!) There are Suicide Prevention Resources at the back of the book, and it actually ends up a hopeful tale. Source: This review is based on my own signed copy, which I got at the 2015 YALSA Symposium in Portland, Oregon. I’m wary of books that try to approach a problem and show it solved in a simplistic way. But this book goes deeper than that. It is a book designed to give us a window into what it feels like to be an immigrant. And yes, the stories are simplified somewhat for very young readers. But the artwork is lovely, and we’re shown how it feels to be in a new place, totally different from where you came from. We meet three children, as they stand alone, to be introduced to their new class. Maria is from Guatemala. “Back home I knew the language.” Pictures show Maria playing soccer happily with her friends. Here there are new words. The sounds are strange to my ears. The pictures show a cacophony of sounds on a playground. Here there are new letters. They lie on the page like scribbles and scratches. All the windows and doors are shut tight. The picture shows Jin looking at letters and seeing them in a nonsensical pile jumbled together. Here there are new ways. I cannot see the patterns. I cannot find my place. One by one, each finds a way to begin fitting in. Jin gets help spelling cloud from a friend, and then shows that friend how to write cloud in Korean. And it turns out that Fatimah is a very good artist and finds she can express herself by drawing and painting. Here there are new beginnings. Here there is a place for me. Here is a new home. I’m afraid that explaining this book won’t communicate how well the pictures tell the story along with the words. And the children portrayed are lovely children, not seen as other. Anne Sibley O’Brien manages to make their eyes look wistful at the beginning, but in a way that makes us want to embrace and comfort them. And we’re all happy about their change of expression and demeanor by the end. 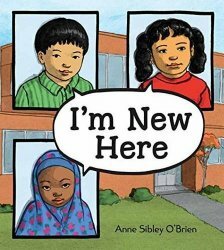 I suspect this book would be good for immigrant children to read as well as for children who will have new immigrants as classmates. But it’s also a good story, a story that helps the reader imagine what it would be like to stand in someone else’s shoes. Dial Books for Young Readers, 2015. 240 pages. I don’t get around to reading a lot of graphic novels, so I only got to this one after it got Newbery and Cybils attention, and I’m so glad I did. This graphic novel reminds me of the wildly popular Smile by Raina Telgemeier — It’s got a similar artistic style and is also about a girl in middle school navigating friendships. Roller Girl, unlike Smile, is fiction, but it’s got the feel of memoir, with a picture of the author on the back flap in her roller derby gear. It certainly could happen. 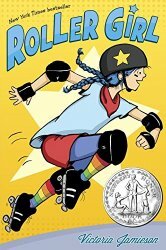 Besides being in so-accessible graphic novel form, Roller Girl tells how Astrid gets involved in roller derby, a sport I certainly didn’t know anything about. Astrid’s best friend Nicole, though, isn’t interested. She wants to go to dance camp this summer, when Astrid signs up for roller camp. And Nicole has a new friend, who is as excited about ballet as she is, but who has no use for Astrid. At roller camp, Astrid is a total beginner and feels like the only one who doesn’t know this stuff. She works hard, but keeps falling. And working hard at roller derby is painful! Then Astrid feels like she blows it even with the new friend she’s made at roller camp. Is she just no good at being a friend? This graphic novel is delightful. Astrid’s spirit — lots of falling, and yes, some grumbling, but she gets right back up — will win the reader over quickly. Mind you, she doesn’t make me want to be a roller girl, but she has me totally on her side, cheering for her. Roller derby — and putting on a “warface” — is also an interesting way to work out anger with a friend. I’m not sure if it’s a healthy way, but it’s definitely entertaining! Though, mind you, Astrid does a good job in the book of facing interpersonal problems (with some stumbles along the way). I have a feeling once a few kids find this book, word is going to spread like wildfire. It’s time for Sonderling Sunday! That time of the week when I play with language by looking at the German translation of children’s books. Today is also Valentine’s Day, so I’m going to look at Gilderoy Lockhart’s celebration of Valentine’s Day in Harry Potter and the Chamber of Secrets, otherwise known as Harry Potter und die Kammer des Schreckens. The Valentine’s Day section is in Chapter 13, “The Very Secret Diary,” (Der sehr geheime Taschenkalender) and begins on page 235 in the English edition, Seite 245 in the German edition. = Wissen Sie, was die Schule jetzt braucht, ist einen Stimmungsheber. “Happy Valentine’s Day!” = Einen glücklichen Valentinstag! = Und damit ist der Spaß noch nicht zu Ende! “the sly old dog!” = der durchtriebene alte Hund! “Oy, you!” = Ei, du! “The hero who conquered the Dark Lord. = Der die Macht des Dunklen Lords schmolz. Well, I didn’t actually finish before Valentine’s Day was done, but I’ll still wish you a belated glücklichen Valentinstag! Spiegel & Grau, New York, 2015. 301 pages. I have perfectionistic tendencies, so the first book of Brené Brown’s that I read, The Gifts of Imperfection, hit the spot for me. It was a 2011 Sonderbooks Stand-out. Then came Daring Greatly, a 2014 Sonderbooks Stand-out. Daring Greatly talks about vulnerability and wholeheartedness. 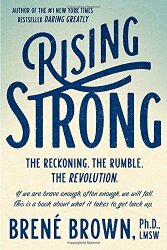 Now she’s written Rising Strong, about getting up when you fall down — which is going to happen if you are Daring Greatly. While vulnerability is the birthplace of many of the fulfilling experiences we long for — love, belonging, joy, creativity, and trust, to name a few — the process of regaining our emotional footing in the midst of struggle is where our courage is tested and our values are forged. Rising strong after a fall is how we cultivate wholeheartedness in our lives; it’s the process that teaches us the most about who we are. She says that if we’re carrying out the call of her other books, we’re going to need this one. If we’re going to put ourselves out there and love with our whole hearts, we’re going to experience heartbreak. If we’re going to try new, innovative things, we’re going to fail. If we’re going to risk caring and engaging, we’re going to experience disappointment. It doesn’t matter if our hurt is caused by a painful breakup or we’re struggling with something smaller, like an offhand comment by a colleague or an argument with an in-law. If we can learn how to feel our way through these experiences and own our stories of struggle, we can write our own brave endings. When we own our stories, we avoid being trapped as characters in stories someone else is telling. Basically, this book gives us a procedure for getting back on our feet when we fall on our face in the arena. That’s where the subtitle comes in. The goal of the process is to rise from our falls, overcome our mistakes, and face hurt in a way that brings more wisdom and wholeheartedness into our lives. Get honest about the stories we’re making up about our struggle, then challenge these confabulations and assumptions to determine what’s truth, what’s self-protection, and what needs to change if we want to live more wholehearted lives. Write a new ending to our story based on the key learnings from our rumble and use this new, braver story to change how we engage with the world and to ultimately transform the way we live, love, parent, and lead. The book fleshes out these ideas with lots of examples, explaining what this looks like. It was interesting to me that while I was in the middle of reading this book, something came up that reminded me of a hurt at the end of my marriage. It popped up seemingly out of nowhere. But armed by this book, I looked at the stories I was telling myself about that incident, and was able to examine what was true and what wasn’t true. I was able to do some forgiveness work and tell myself a better story. The whole idea of saying, “The story I’m telling myself is…” can be eye-opening, and gives us more power over our feelings and the ability to revolutionize our lives and relationships. You can tell I love Brené Brown’s writings, because once again, lots of quotes from this book show up in Sonderquotes. I bought myself a copy so I can look through it again. I highly recommend all of her books. If you ever face difficulty? Grab this one. It will help you rise strongly, ready to dare greatly again. Source: This review is based on my own copy, purchased via Amazon.com. You are currently browsing the Sonderbooks blog archives for February, 2016.